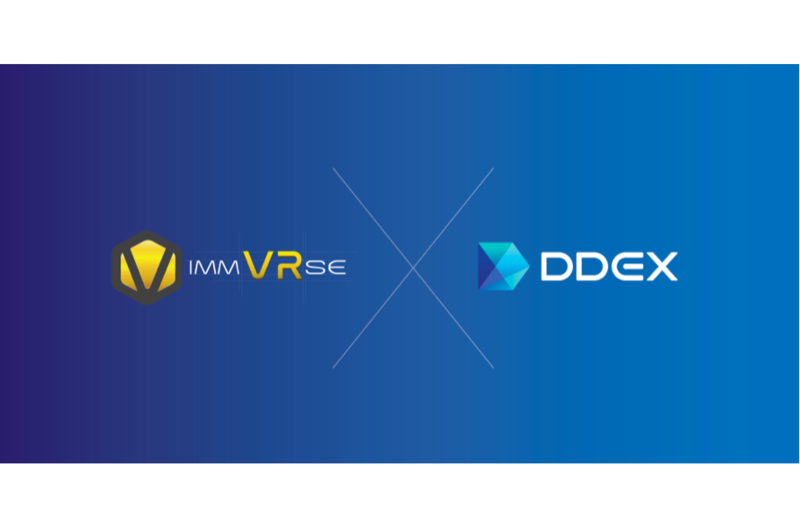 Bitcoin Press Release: ImmVRse Token (Symbol: IMVR), the ERC20 utility token for VR professionals has been listed on DDEX, one of the top five decentralised exchanges in the world. Industry-leading decentralized exchange DDEX offers IMVR traders instant and real-time on-chain settlement on the decentralised platform. October 2nd, 2018, London UK – Following a token sale conducted between July and September, the VR marketplace platform, ImmVRse, with a combined social media following of 48000 across various channels is progressing towards transforming IMVR into a truly global utility token. The aim of the ERC20 token is to be used as a utility token for ImmVRse DApp, and any other application that will be built within the ImmVRse ecosystem. To celebrate listing of IMVR on DDEX, the exchange has announced a trading competition. The trading will run from 15:00 September 25, 2018 to 15:00 October 7, 2018 (GMT + 08:00). A total of 400,000 IMVR will be distributed in rewards. More information is available here. With an aim to target the global market, IMVR will be listed on more DEX and traditional exchanges in the coming months. ImmVRse will also announce further giveaway and trading competitions within the next few weeks. Using Ethereum smart contracts and the 0x protocol, DDEX allows users to trade digital assets directly from wallet-to-wallet. Built on hydro protocol technology, DDEX is one of the top decentralized exchanges by both total number of transactions and trading volume. ImmVRse is a decentralised VR content sharing platform that will aim to offer creators of the content, VR brands, and advertisers a chance to get the product or service out into the public space. The ImmVRse DApp will work as a smart-contract based marketplace for VR professionals. The platform will have its very own native token, the ImmVRse token (IMVR), which will be used as the form of payment between all parties within the ecosystem. ImmVrse is the source of this content. Virtual currency is not legal tender, is not backed by the government, and accounts and value balances are not subject to consumer protections. Cryptocurrencies and tokens are extremely volatile. There is no guarantee of a stable value, or of any value at all. Token sales are only suitable for individuals with a high-risk tolerance. Only participate in a token event with what you can afford to lose. This press release is for informational purposes only. The information does not constitute investment advice or an offer to invest. The post ImmVRse’s IMVR Listed on DDEX – An Advanced Decentralised Exchange appeared first on Bitcoin PR Buzz. Bitcoin Press Release: ARAW announces their Token Ecosystem, a fully featured platform revolving around a utility based token that aims to disrupt the global E-Commerce Marketplace and Payments industry. May 20th, 2018. London, UK: The cryptocurrency and blockchain spaces have been growing exponentially over the last few years and thousands of companies and start-ups have been innovating through the blockchain. These companies have created tokens, which all have different purposes. Some tokens have a specific business application, while others just represent equity. Most companies in the industry have very similar visions and projects, but occasionally some really stand out and show huge potential. This is the case with ARAW. This company is creating the ARAW Token Ecosystem, a fully featured platform revolving around a utility based token that aims to disrupt the global E-Commerce Marketplace and Payments industry. ARAW is the decentralized payment for e-commerce ecosystem. They are on a mission to provide end-to-end solutions for e-commerce Marketplace, Touch & Pay Cryptocurrency Card, Online Cryptocurrency Payment, and Unified Reward System powered by the Ethereum Blockchain. A well-seasoned team of technology geeks and developers are building the ARAW Token platform with their extensive experience developing complex finance and banking systems from scratch. Their advisory board members John Wellman, Group CEO of Bleep & Dr. Jane Thomason, Advisory Board member of the British Blockchain, are part of the best in the e-commerce and Blockchain industry and they have huge social impact. The goal of the ARAW token is to be a part of everyone’s day-to-day online & in-store shopping. The company is aiming to contribute to the global Blockchain User Adoption by intuitive and seamless integration of vastly used E-Commerce channel with the Decentralised Payment such that regular people across the world can benefit from the cryptocurrency without needing them to change their shopping behaviour or understand the complexity of the Blockchain technology. One of the key “components” of the ARAW token ecosystem is its mobile application. On the application lies an e-commerce marketplace where customers can shop digitally using the ARAW token. Moreover, the mobile application provides a cryptocurrency wallet for multiple coins and tokens, as well as fiat currencies. This includes the ARAW token, BTC, ETH, and USD. There is also a digital currency exchange built into the mobile application, which lets users exchange cryptocurrencies to other cryptocurrencies and to fiat and vice versa. Another strong feature is the Banking System Integration in the app, which allows users to top-up using bank accounts and to obtain cashback on the ARAW tokens. Customers will also be able to shop in physical retail stores using the ARAW Touch & Pay Card. The goal of the ARAW is to make regular people accustom to use ARAW card for their daily shopping and time-to-time reward them out of box. To increase the merchant adoption rate, the ecosystem introduced Araw Pay, the decentralised payment gateway, which allows merchants to accept online payments with the ARAW token with a click of a button. Why it is the future of E-Commerce and Payments? The ARAW Token Ecosystem is the first of its kind. With cryptocurrencies and the blockchain technology taking off in the recent years, many innovations have seen the light of day but none were as complete as the ARAW token ecosystem. It has the potential to disrupt a whole industry in one of e-commerce and payments. This is the case because it provides end-to-end solutions for this industry that is almost begging for change and modernization. With its open API and its plug & play e-commerce platform, the ARAW Ecosystem is really easy to adopt for large enterprises, and it makes it effortless for small and medium merchants around the world to build their own blockchain based e-commerce platform, which in turn will drastically improve revenue. ARAW has seen very rapid and exponential growth over the past couple of months. They currently have users from 170 countries, in 4808 cities! In addition, they have 45,000+ Twitter followers & 50,000+ Telegram group members, which they use to make announcements and spread various news. Furthermore, the platform and the ecosystem have been praised in a lot of YouTube reviews across the world. ARAW is currently having a high demand in private sale. The pre-sale registration for has been ongoing and pre-sale will start on 1st July. The token is KYC approved and the team is working closely with exchanges to list the token after the token event. ARAW is the source of this content. Virtual currency is not legal tender, is not backed by the government, and accounts and value balances are not subject to consumer protections. Cryptocurrencies and tokens are extremely volatile. There is no guarantee of a stable value, or of any value at all. Token sales are only suitable for individuals with a high risk tolerance. Only participate in a token event with what you can afford to lose. This press release is for informational purposes only. The information does not constitute investment advice or an offer to invest. The ARAW token sale is closed to US participants and participants of all countries in which ICOs are illegal. The post ARAW Token – Announce their Decentralised Payment & E-Commerce Platform appeared first on Bitcoin PR Buzz. April 15, 2018, London,United Kingdom – After some popular hard forks of the bitcoin blockchain in 2017 such as Bitcoin Cash and Bitcoin Gold, a new fork is on the horizon and an exciting one at that. The FOXBTC hard fork, performed by tech company Z-Magnetars will happen on April 30th at block height 520419. The decentralization of bitcoin enables anyone to change its protocol and technical specifics such as mechanism, block size, block interval, mining incentives etc. 2017 was the year of the first major bitcoin forks with two coins really standing out – Bitcoin Cash and Bitcoin Gold. Bitcoin Cash aimed at improving scalability of bitcoin by increase block size to 8MB. While it’s arrival on the scene was received with lots of skepticism, it’s price peaked at $3900 with a market cap of $65 billion. Its biggest disadvantage however was mining centralization as a few larger pools were dominating it. Bitcoin Gold was the other major fork in 2017 which occurred in October at block height 491407. The currency aimed at restoring decentralization of miners by enabling GPU mining. Bitcoin Gold in addition implemented a new Proof of Work mechanism and an Equihash function. The price peaked at about $490 with an all-time high market cap of $5.9 billion. With a number of other forks which occurred in 2017 and more so coming up this year, having access to every airdrop would enable users to reap the full value of bitcoin and its decentralized character. And the next fork, enables users to do just that. FOXBTC aims to empower company-based forking in the crypto markets by enabling users to store and exchange any airdrop. Users will be rewarded on a 3,6 and 12 month basis through the FOX airdrop program. Based on a hybrid Proof of Stake and Proof of Work mechanism which provides a 6% annual incentive for staking, the FOX BTC implements a standard GPU power mining with an incentive of 50 coins per block. Similarly to Bitcoin, FOX BTC will have a limited supply, with around 16.5M coins in circulation, 5.5M coins in the hybrid Proof of Stake + Proof of Work mechanism and 5M coins allocated for the airdrop, 1M of which will be held by the team of Z-Magnetars. With 9 Bitcoin forks already executed in 2018 and at least 25 more coming up this year, FOX BTC enables crypto users to have full access and control and airdrops. Users will be able to enjoy the true benefits of decentralization, bringing us one step closer to mass adoption of cryptocurrencies. FOXBTC is the source of this content. Virtual currency is not legal tender, is not backed by the government, and accounts and value balances are not subject to consumer protections. Cryptocurrencies and tokens are extremely volatile. There is no guarantee of a stable value, or of any value at all. Token sales are only suitable for individuals with a high risk tolerance. Only participate in a token event with what you can afford to lose.This press release is for informational purposes only. The information does not constitute investment advice or an offer to invest. The post FoxBTC Announce Hard fork to Commence April 30th 2018 appeared first on Bitcoin PR Buzz. Bitcoin Press Release: UHIVE next generation social networking app introduces a hybrid concept and launches token generation event (TGE). LONDON, UK, April 11th, 2018: A novel social media network introducing its innovative hybrid centralized/decentralized concept is poised to inaugurate the new digital life era. UHIVE, the project that is being developed by UHIVE Ltd., is about to reach its next milestone, which is the launch of its Pre-TGE and Crowdsale TGE for its proprietary, eponymous digital token (UHIVE). UHIVE tokens are the fundamental currency powering the UHIVE social network, which has been described as “a new hybrid blockchain system which uses the best of both worlds (centralized and decentralized)”. More specifically, the UHIVE social network will be comprised of two worlds, the Civilized World, and the Grey World, which differ in terms of governance, freedom of expression, and even the presence of an element of surprise. On the other hand, the Grey World is a wholly anonymous and non-regulated blockchain-powered space where members can freely express their thoughts and feelings, and create undisclosed groups where they can mingle with other, anonymous members. Since the Grey World is largely uncharted, users will be able to stumble upon areas by chance, and discover new things that might interest them. The UHIVE platform adds a new dimension to digital marketing, offering significant benefits to marketers, influencers, and consumers alike. Brands and strategists will now have the chance to select UHIVE spaces with high traffic, as well as influencers-members of the UHIVE platform, to target their audiences with improved specificity. What’s more, a significant portion of the UHIVE advertising revenue will be given back to UHIVE social network users, in the form of UHIVE tokens, so as to contribute in sustaining the UHIVE economy, create user loyalty, and organically promote the token’s growth. A maximum of 3 billion UHIVE tokens will be made available for purchase during the company’s Pre-TGE, which will take place April 11, 2018 – April 30, 2018; while a further 14 billion in total will be up for sale during the company’s Crowdsale TGE, from May 2, 2018 – July 15, 2018. During the latter, the company will also be awarding a total of 3 billion tokens in bonuses to UHIVE token buyers, bringing the total of UHIVE tokens released during these two phases to 20 billion. The remaining 60 billion out of the total 80 billion tokens issued are expected to be released to exchange platforms, to the UHIVE team and company advisors. UHIVE has shared that the UHIVE beta app release for Android and iOS is expected sometime in October, 2018. UHIVE currently runs a promotional offer, giving 1,000 to 10,000 free UHIVE tokens to anyone who joins its Telegram group and remains a member of it until the end of the company’s TGE. Those interested in doing so can join through here. Hazem Bustami is the source of this content. Virtual currency is not legal tender, is not backed by the government, and accounts and value balances are not subject to consumer protections. Cryptocurrencies and tokens are extremely volatile. There is no guarantee of a stable value, or of any value at all. Token sales are only suitable for individuals with a high risk tolerance. Only participate in a token event with what you can afford to lose. This press release is for informational purposes only. The post UHIVE The Next-Gen Social Networking App Announces Token Event appeared first on Bitcoin PR Buzz. Bitcoin Press Release: CoinPoint rocked the night away during their successful Bitcoin Cash Party at Tapa Tapa Bar near Excel Conference Centre in London last February 8th, 2018. Dr. Craig Wright of nChain and English professional snooker player Ronnie O’Sullivan joined the party, along with nearly 200 attendees composed of gaming executives and crypto industry leaders from around the world. 16th February, London, United Kingdom – The CoinPoint Bitcoin Cash Party is a celebration of the use of Bitcoin Cash as a sustainable and innovative electronic cash system for faster, safer, and more efficient global transactions. Everyone in the party was asked to download a Bitcoin.com wallet to receive free Bitcoin Cash, which they promptly redeemed to get free drinks at the bar. Said Eilon Arad, CoinPoint’s Director of Business Development based in Manila, Philippines, in an interview. The Bitcoin.com sponsored event by CoinPoint, the leading cryptocurrencies and Blockchain agency, showcased the simple, fast, and reliable approach of Bitcoin Cash in various channels, including micropayments and e-commerce. Said Oron Barber, CoinPoint’s CEO, based in Bulgaria. Besides drinks, music, and Bitcoin Cash, BetterBetting Foundation CEO Adriaan Brink announced in the party the BetterBetting ICO winner of a Ronnie O’Sullivan-signed snooker cue. During Brink’s speech, which celebrated the end of a successful ICO supported by CoinPoint, he revealed that the next step would be to switch their peer-to-peer betting technology using smart contracts, to Bitcoin Cash once it is made available. The CoinPoint Bitcoin Cash Party was a highly anticipated VIP event covered by the team of CoinGeek, CoinChoose, iGaming Business, and other global media outlets. Meanwhile, CoinPoint will launch several Bitcoin Cash-related platforms that aim to improve merchant and user adoption as well as education of the market. CoinPoint is the premier cryptocurrencies and Blockchain agency based in Bulgaria, Australia, and Philippines that provides innovative solutions for different markets. It offers a wide range of digital marketing services, including crypto and blockchain consultations, pay-per-click campaigns, email marketing, and more. With many years of high-quality service, the company has built a strong network of global partner and renowned clients around the world. For more information, please visit https://www.coinpoint.net/. The post CoinPoint Holds Successful Bitcoin Cash Party in London appeared first on Bitcoin PR Buzz. Left – CEO Farabi Shayor delivering a session at Imperial College London, Right – ImmVRse COO and CIO with the Clinical Research Institute Theme Lead Dr. Saleh (Far Right) and his medical students in the centre. Bitcoin Press Release: ImmVRse will be working with a group of bright medical students to study “The Impact of Virtual Reality on Neural Activity”. February 13th, London, UK – The next frontier is truly the mind. To explore our vast galaxy, one of the most useful avenues has been Virtual Reality (VR). What makes VR so special is its ability to allow you to transport into another world without literally having to move an inch. That said, even though the body is not moving, the brain is enormously stimulated, triggering significant amounts of neural activity. There are many VR research projects currently ongoing. University of Southern California Institute for Creative Technologies has a MedVR lab dedicated to explore various aspects of medical science such as, medicine, psychology, neuroscience and physical and occupational therapy. They are researching the use of VR to assist people with phobia and trauma to cope in a controlled environment. At the University of Washington, they have done extensive research on VR with regards to managing physical pain. Various training programs have been created and the highly successful game known as “Snow World” which immerses burn victims in the world of snowball fights with a snowman. This was especially designed with child burn victims in mind. Additionally, engineering students at Stanford University have created a virtual reality technology called SUSIE (Senior-User Soothing Immersive Experience) for seniors who cannot leave their homes so that they may be able to experience the outdoors whilst physically being homebound. In this manner, VR can not only create jobs, but also help save lives. ImmVRse believes that concentrating on research and development projects by forming a close partnership with universities will unlock the next chapter of this remarkable technology. The company has tied partnership with Imperial College London to conduct VR-Neuroscience research. Clinical Research and Innovation (CRI) is a brand new course in the early years of medical degree at the Imperial School of Medicine. The purpose of this course is to teach students to conduct research analysis in addition to studying theories. This research experience will be supervised by CRI Theme Lead, Dr. Saleh. The VR research team will be led by the CEO of ImmVRse, Farabi Shayor. Six students – Ela, Shivam, Mai, Ruhi, Rachel and Francesca will be joining ImmVRse in conducting the research. The students will be using medically approved 12 channel Electroencephalography (EEG) headsets to monitor electrical impulses and neural activity. The participants are expected to wear VR headsets and interact with both passive and active VR whilst their EEG graphs are logged and analysed. The outcome of this research will deliver robust scientific conclusions in relation to the effect of VR on humans. Essentially, ImmVRse hopes to build upon existing studies to unlock the complexities of the human brain, whilst proving that VR has the potential to become a major breakthrough consumer technology in the coming decade. ImmVRse is backed by an ensemble of experts from a range of sectors, including relevant technologies, IT Management, VR, computer security and blockchain development. Four years’ experience in Marketing and Journalism, previously Co-Founder of MadBuzzHK, proficiency in online content development. Adrian achieved a MSc in Marketing Communications and Advertising. ImmVRse is the source of this content. Virtual currency is not legal tender, is not backed by the government, and accounts and value balances are not subject to consumer protections. This press release is for informational purposes only. The information does not constitute investment advice or an offer to invest. The post ImmVRse Collaborates With Imperial College To Lead Research On Impact Of VR On Neural Activity appeared first on Bitcoin PR Buzz. 8th February 2018, London, UK – Liquidity is one of the largest challenges in the world of cryptocurrency today. Exchanging cryptocurrencies from one blockchain (or token form) to the next has become as simple as drawing breath. However, the same cannot be said for exchanging cryptocurrencies to fiat currencies. Users often have to subject themselves to a vicious circle of hoops, converting from one cryptocurrency to the other before further subjecting themselves to a bunch of confirmations before finally being able to cash out in fiat. It’s the most substantial obstacle standing between crypto and widespread adoption — it just isn’t practical. Denaro addresses this problem through its innovative, multi-cryptocurrency wallet and physical debit card. Denaro allows users to access, store, and spend their cryptocurrencies using a user-friendly web wallet or physical debit card at any online or offline payment terminal. Users will be able to load the card with either BTC, ETH, or Denaro’s native DNO token and use it as part of their daily lives without having to convert from one crypto to the other, as merchants will be able to accept a multitude of crypto payments through payment terminals and customizable API/SCI functions. Through seamless payment terminals for merchant services, IBAN numbers, and API/SCI, Denaro aims to finally bridge the divide between the crypto community and traditional financial infrastructure by making cryptocurrency consumption as simple as inserting a card or clicking a button. Denaro also offers personalized debit cards for both merchants and customers with high volume, though merchants seem to be the one getting the better end of the deal — they receive a free payment terminal as part of our mission to encourage mass adoption. Denaro’s smart contract-powered wallet is integral to every interaction in the Denaro ecosystem. The wallet serves as a secure storage and exchange gateway for both cryptocurrencies and fiat currencies, allowing users to deposit, hold, send, and exchange supported cryptocurrencies and fiat currencies through seamless peer-to-peer channels. The platform’s constantly evolving DNO utility token powers all settlements on the Denaro network. The DNO token entitles its holders to a wide range of exclusive advantages, including bonuses, discounts, and premium merchant services on the network. Denaro will be incentivizing its ecosystem by distributing a portion of its network transaction fees; they will be distributed among existing DNO tokenholders when certain milestones are satisfied. Following a successful, sold out Pre-sale, Denaro have announced the launch of the Main Token Sale, beginning 9th Febuary 2018, 12:00 UTC. Participants will be able to contribute to the event using ETH, BTC, LTC and epay.com’s fiat payment gateway. Denaro will be rewarding early contributors/investors and community participation with a generous bonus-and-referral commission system, which issues community members with 3% of every purchase made by their referrals. The Main Sale bonus system consists of a 25% bonus for the first 15 million tokens sold, 10% for the following 20 million tokens sold, and 5% for the next 25 million tokens sold. The post Denaro Announces Platform to Solve Crypto-liquidity Problem, Sells out Pre-sale with Main Sale Imminent appeared first on Bitcoin PR Buzz. Bitcoin Press Release: Litecoin Cash has announced that the countdown has begun towards the release of a new cryptocurrency that will be born from a hard fork of Litecoin (LCC). At Litecoin block 1371111, Litecoin Cash (LCC) will be created. February 8th, 2018, London, United Kingdom: Everyone holding Litecoin will automatically receive 10 Litecoin Cash for every Litecoin they own. While Litecoin has always been mined with Scrypt, Litecoin Cash is a proof of work cryptocurrency securing the network using the SHA256 hashing algorithm. This allows an extension of life for older Bitcoin mining hardware, which is no longer powerful enough to mine Bitcoin; the lower anticipated difficulty of mining Litecoin Cash will put such legacy hardware to effective use. Litecoin Cash has significant advantages compared to the other main SHA256-mined coins, Bitcoin (BTC) and Bitcoin Cash (BCH). While those currencies both have a 10-minute block time, Litecoin Cash’s 2.5-minute block target allows much faster transaction confirmation. Compared to Litecoin itself, the new fork features superior mining difficulty retargeting, via the proven DarkGravity algorithm used by Dash. Transaction fees are also reduced by 90% to provide incentive for real-world use. In order to ensure a fair launch, Litecoin Cash implements slow-start control to block rewards and intend to pre-release a bootstrap file to prevent a blockchain download race once the wallets become available (slated to happen shortly after the fork block). The network will use a new address prefix and replay attack prevention to eliminate inter-chain issues and minimize user confusion. The markets have become accustomed to Bitcoin hard forks over recent months, but Litecoin Cash brings the concept to a new space and potentially a new set of users. As such, the development team is very keen to provide user education and promote “responsible forking”. A private key that holds currency should never be pasted into any website or wallet application in order to claim forked coins, and the team encourages users to move their Litecoin to a completely new address after the fork, before using the private key from the “old” address to claim their Litecoin Cash. Although the fork is currently expected to occur at 02:00 UTC on Monday 19 February, the predicted fork time may move slightly earlier or later, as the precise time block 1371111 is reached depends on the available Litecoin mining power. Litecoin cash have made is really easy to claim. No need to mess around in the debug console. Just download a wallet for you platform straight off the offical Litecoin cash website, you’ll find a menu item to help you import your Litecoin private keys and claim your Litecoin Cash. IN ALL CASES: Practice safe forking. That means you must never paste private keys that hold live funds into ANY website or wallet in order to claim forked coins — including the Litecoin Cash website. The post Litecoin Cash – The First Litecoin Fork appeared first on Bitcoin PR Buzz. Bitcoin Press Release: Game developers can now see how Ethereum-based smart contracts are used to determine game outcomes on the JoyToken Platform. London, UK; January 19, 2018 — Today JoyToken released its API protocol to demonstrate how games will run on the JoyToken platform. Developers will be able to use the JoyToken protocol to build games incorporating JoyToken’s smart contracts, and contribute to the foundation of a trustless online gambling ecosystem. Using smart contracts to distribute winnings, determine RNG values, and provide an audit trail of transactions, participants need not trust fellow players, developers, and casino operators. Instead, players can check the game code based on this API to verify that the odds are as advertised. Casino operators need not pay for a third party back-end to execute payouts, as these will be distributed automatically. Developers can continue to earn rewards paid in JoyTokens for the games they create. JoyToken is a platform and protocol that forms the foundation for a “trustless” gambling ecosystem wherein smart contracts are used to automatically determine game outcomes. JoyToken’s greater aim is to further the growth of the gambling industry by creating entrepreneurial opportunities for game developers who otherwise may not have access to a large audience. By joining JoyToken’s platform, game developers can gain distribution and earn rewards from their games. The post JoyToken Releases Developer API to Showcase Smart Contract Functionality appeared first on Bitcoin PR Buzz.